Sleeping under canvas has never been so exciting - and in some cases so luxurious! For most people the idea of spending the night under canvas surrounded by the sounds of the African bush brings to mind the romance of a bygone age of adventure. Fortunately there are dozens of tented safari lodges and camps all across Southern and East Africa where it is possible to recapture this magic. Many of these lodges offer a level of luxury that would normally only be found in the very best 5* hotels, with many ‘tents’ boasting air-conditioning, luxury bathrooms, and even private plunge pools! For guests travelling on a more modest budget, there are other tented lodges and camps which offer less extravagant accommodation, however the tents are all still large enough to have proper size double or twin beds and en-suite bathrooms…it’s still a long way from most people’s traditional idea of ‘camping in a tent’! 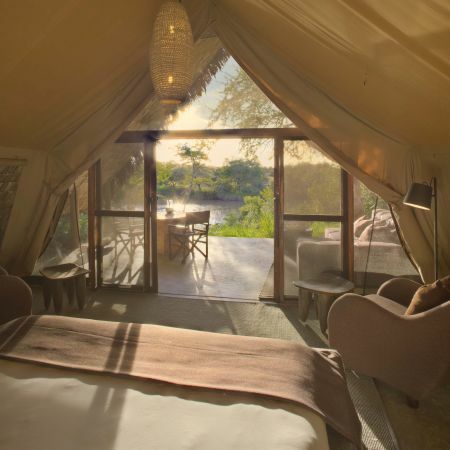 Especially in East Africa, some of the tented camps are what is known as ‘semi-permanent’. This means that they have no permanent cement structures like swimming pools, or brick/stone built areas, so the camps can be completely dismantled and removed, leaving a virgin site that has not disturbed the natural environment whatsoever. These camps also tend to be run off generators and have solar powered lighting, which really enhances the eco-friendliness aspect. Another popular ‘tented’ experience in East Africa, which is offered by many of the lodges for guests staying 3+ nights, is to do a mobile/fly camp safari for one night. Your fly camp is set up in advance by the camp staff, and you either walk there as part of your day’s safari activity, or you drive there after your last game drive. Fly camping is about adventure, not luxury – your bed is comfortable and the crew cooks amazing meals in the middle of the wilderness, but tents are simple (normally 2 man dome tents), with outside shower and bathroom facilities. The 15 rooms are spacious and all have en-suite bathrooms with hot showers and toilets. For those chilly upland nights enjoy the warmth of your own African-style firepot. Whistling Thorn Camp can accommodate up to 20 guests in canvas en-suite tents with permanent grass-thatched ramadas. At night, the tent is lit by gas lamp, and you will have your own electric torch. There are 27 modern tents with a private view over the wildlife-rich riverbanks. Each tent has soft 4 poster beds, mahogany closets and desks, and en-suite bathrooms with steaming hot showers. The 17 tented rooms are raised up slightly on earth mounds, overlooking the river and the plains. These mounds are covered in vegetation, and feel quite natural, and each one has been sited under its own cluster of shady indigenous trees and you do feel like you are out in the wilderness. Each of the 8 double tents have their own toilet and shower, so you can enjoy the luxury of en-suite living 'safaris style', with hot water heated over a log fire and bought to your shower when you're ready. Low watt LED lighting in each of the tents runs off rechargeable batteries and solar panels, otherwise guests can enjoy the romance of candles and lanterns…a truly authentic tented camp experience.